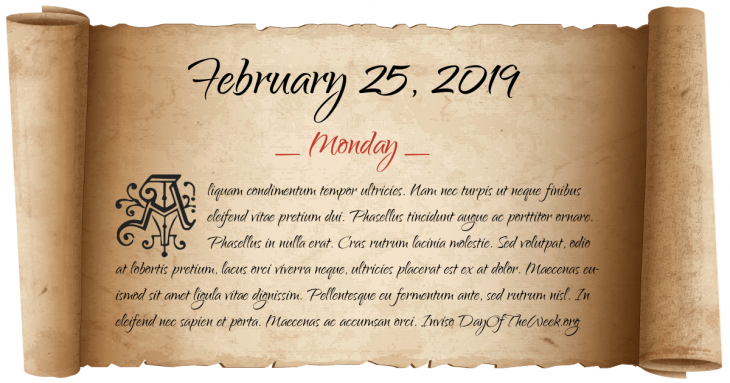 What Day Of The Week Was February 25? Colonel William Tate and his force of 1000-1500 soldiers surrender after the Last Invasion of Britain. Provisional Cession of the Hawaiian or Sandwich Islands established by Lord George Paulet. Miners in Calaveras County, California, discover what is now called the Calaveras Skull, human remains that supposedly indicated that man, mastodons, and elephants had co-existed. Charles Jenkins Laboratories of Washington, D.C. becomes the first holder of a television license from the Federal Radio Commission. In his speech On the Personality Cult and its Consequences Nikita Khrushchev, leader of the Soviet Union denounces the cult of personality of Joseph Stalin. BDR massacre in Pilkhana, Dhaka, Bangladesh. 74 people are killed, including more than 50 army officials, by Bangladeshi Border Guards inside its headquarters. Who were born on February 25?